Sometimes we enter into situations in life when one of the best fighting knife selections on the market can prove, not just beneficial, but as something that saves your life. A fighting blade is something one would expect a soldier to carry during combat. Some people choose to carry a fighting blade on them wherever they go in an effort to be prepared for whatever might happen. A fighting blade is also something the survivalist can benefit from when out in the wilderness. 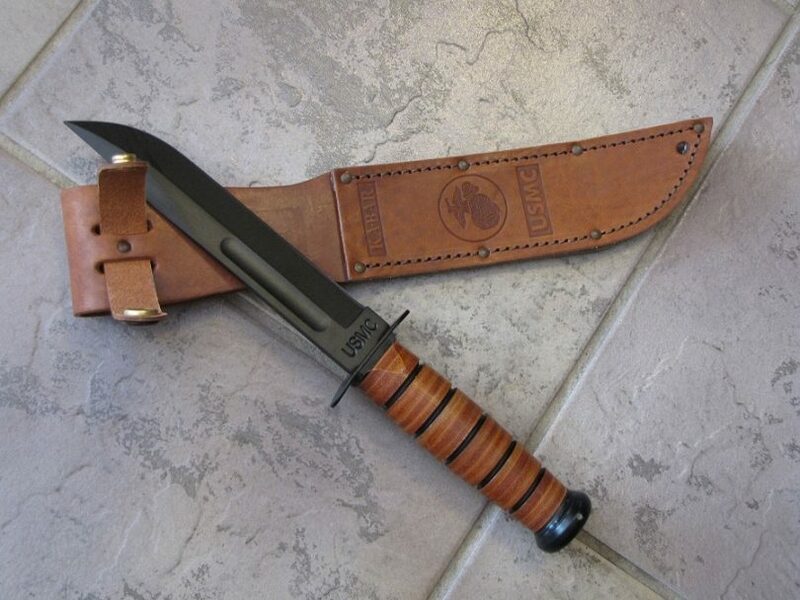 This type of knife is not just about fighting off someone or an animal attack; it is also excellent for using in situations where one is fighting for survival in the wilderness. A high-quality, durable knife with a good grip can serve in helping with hunting prey, cleaning the kill so it can be readied for cooking, fishing and scaling the fish, and when camping, the knife can serve in helping make lighter work out of otherwise cumbersome tasks. Whatever you plan to use a fighting knife for, you want it to be dependable. At one time only used during hand to hand combat, today’s fighting blades serve dual purposes as a self-defense weapon and a utility blade. See our review of the best combat knives for more options. Don’t forget to take care of your knives. Check out our piece on how to sharpen a knife for more information. We made a quick list with the best blades you can find on the market and their uses when you are out, in the wilderness. 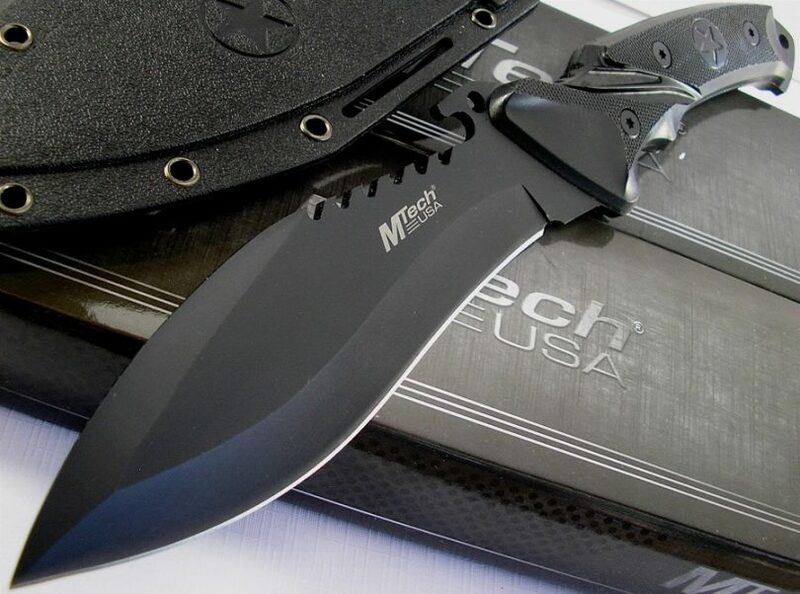 M-Tech is a company known for making durable and affordable weaponry. The M-Tech MX8054 Fighting Blade is affordable and priced between $29.75 and $42.95 depending on where you buy and the listing price. The MX8054 is an exceptional weapon for survival training, camping, and utility uses. It is made with a black tanto blade crafted out of 440 stainless steel materials. The handle is made to give a solid grip to the user, even when wet. The knife measures 11 inches in length (this includes the blade and handle). It is a weapon made for tactical use and features saw back serrations that run along the spine and a blood groove. The blade contains carbon as well as stainless steel, thereby lending to its extra durability. Carbon makes the blade have a better edge retention as well as extra hardness grade. Like this amazing product? Then you can buy it on Amazon. The US Marines Corps Fighting Knife by Ka-Bar is a must have addition on the list of the high-quality fighting blades you can buy today. 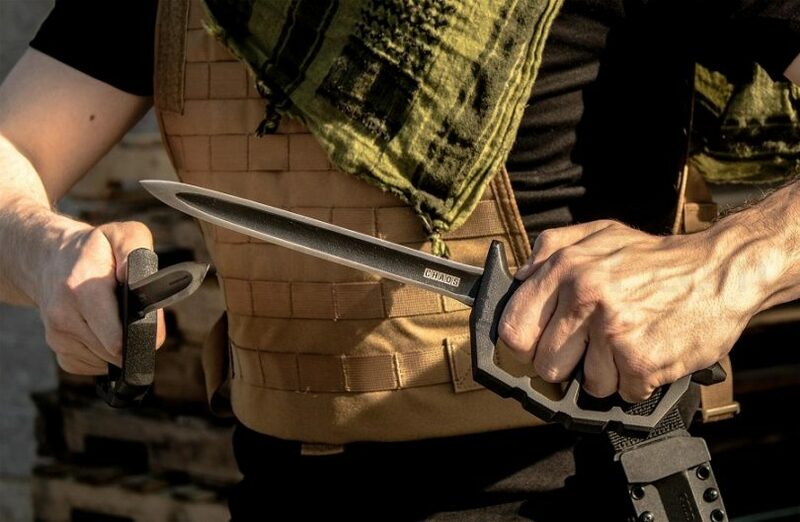 The Ka-Bar Marine Corps Straight Knife is definitely on the more expensive side of the spectrum, but you will find it is definitely worth the initial investment. This weapon was originally made to serve military personnel during World War II and the knife is still in use today. It has been available for use for over seven decades. If you think that this product could be useful for you, then you can buy it from Amazon. Smith & Wesson is not just well-known for the guns the company manufactures as they also make some high-quality knives. 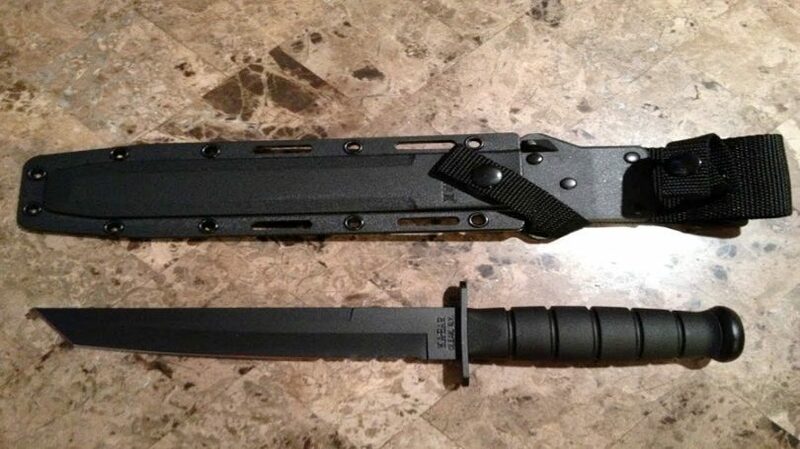 The Black HRT Boot Knife model number SWHRT9B by Smith & Wesson is another exceptional fighting weapon to consider. What’s nice about this blade is that even with the well-known branding the price remains exceptional. You can get the SWHRT9B for $16.75. The weapon is tested to ascertain the maximum durability of the unit and the company makes the knife with the notion of “rough use” in mind during its making. 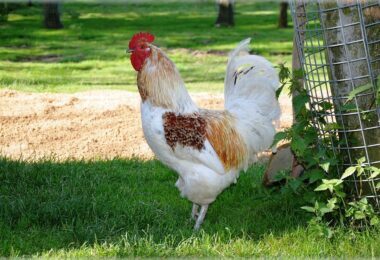 It features a comfortable feel, weight, and is well-balanced. The guard on the knife is just a bit wider than the accompany sheath. The balance point of the blade is fixed just beneath the knife guard. Like this amazing product? Then you can buy it from Amazon. 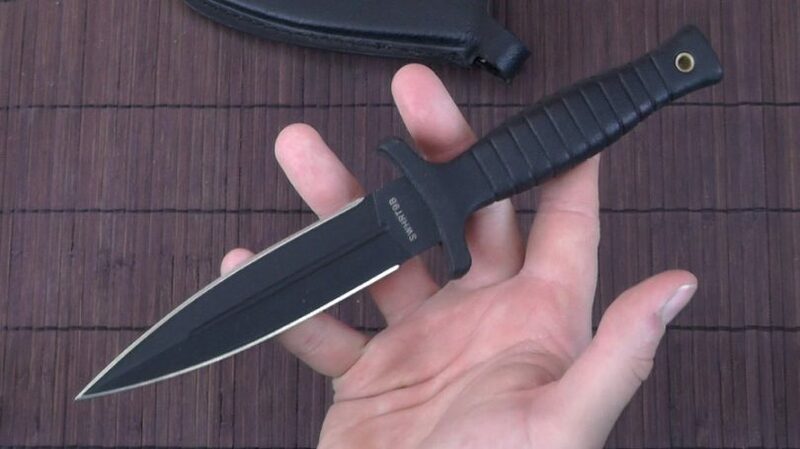 The Black fighting blade by Ka-Bar is also known as the model number 2.1271-0. The weapon is a midrange fighting blade priced around $62.99. The Ka-Bar fighting knife is one hosting a sturdy 8-inch long blade. The angle on the edge of the steel blade is 20 degrees. The entire length of the weapon is 12 7/8 inches. The steel blade is made of 1095 carbon steel. This knife is easy to grip, comfortable to hold, and well-designed for multiple tasks. The large size of the knife requires that the sheath features two snap straps on its handle. The speed in which one can access the blade from the sheath it is sold with is mildly limiting, so you might want to invest in a sheath that offers easier access, such as a Kydex sheath. The handle of the weapon is a blackish-grey color. Cordura/leather sheath comes with the weapon to protect the blade. The sheath is well constructed. The knife’s dimensions are 13.2×3.1×2.2 inches. If you like this product you can find and check its price on Amazon. The Mark II model number 22-01874 is a product made by Gerber. This knife is a bit more expensive than others on the market, but it still makes the list of the top knives you can choose for survival purposes because it has so much to offer in the way of both feature and function. The Mark II, has been, and remains, a popular blade – it was used during the Vietnam era and the weapon was used during a number of military operations in the Vietnam, Iraq/Kuwait wars. Military personnel have carried the Mark II in operations staged in Korea, Grenada, Chad, Panama, Saudi Arabia, Kuwait, Iraq, Somalia, Macedonia, Bosnia, Herzegovina, Afghanistan, and more. The knife has been created in a number of versions between the late 60s and late 90s. In 2001, there was a special edition of the weapon made for the 35th anniversary of the weapon and a year later another limited edition was manufactured. There was a short time when the knife was not being made, and then in 2008, the company took up producing the exceptional blade once more. 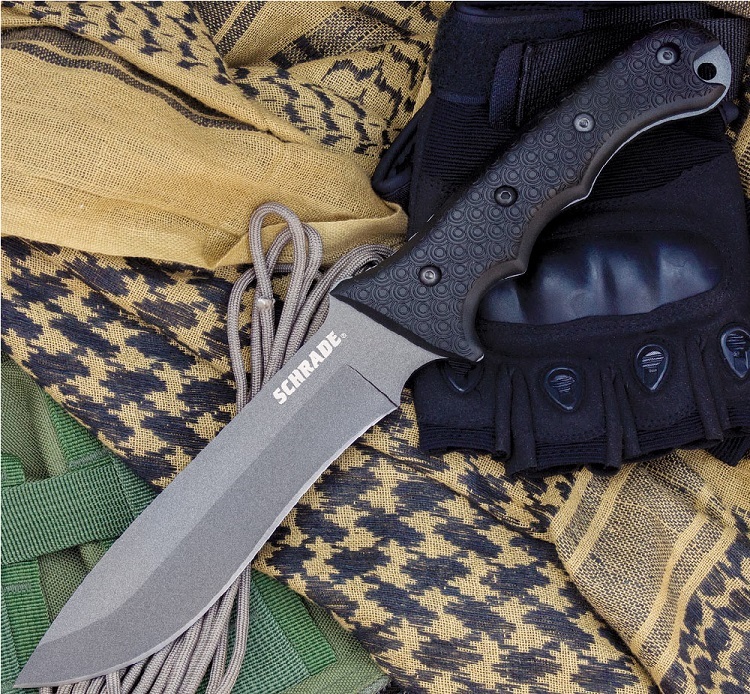 The Gerber Mark II has durable, rugged design. It has a 420HC steel blade with a double serration. The blade has a coating of black oxide to give the knife a low profile look. The handle is durable and made of hearty aluminum. This blade is even field tested to ensure its quality. Like this amazing product? Then you can check its price here. The 80NTP Chaos Double-Edged Fighting Blade is a production by none other than Cold Steel. The weapon is priced around $51.23, so it is clearly affordable. The handle is made of 6061 Aluminum and it is 6 inches in length. The blade is 4.5 mm thick. The entire weapon measures 13.5 inches long and the blade is a durable SK5 High Carbon Steel blade. The Chaos is a double-edged dagger superior for survival uses, camping, hunting, and fishing endeavors. This dagger has been inspired by World War trench knives. 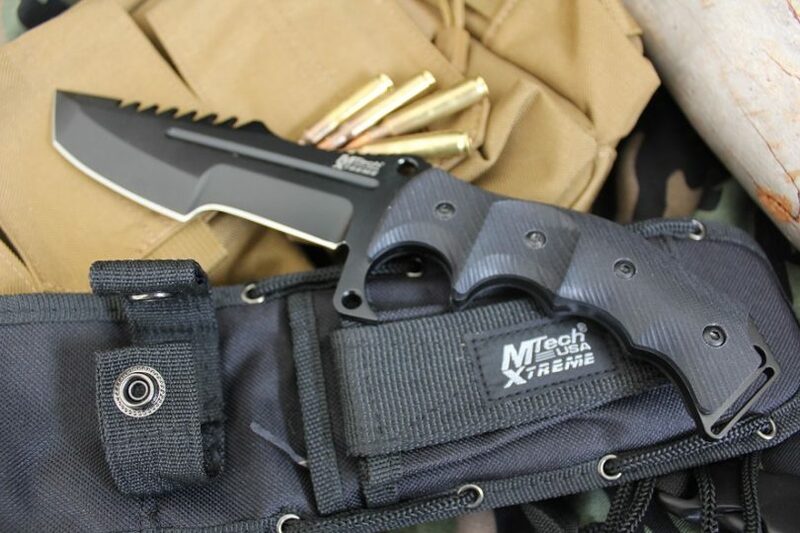 The tactical weapon features a fixed blade that is suited to the modern day survivalist. The weapon has a D-ring guard manufactured out of aluminum and therefore lends to ease of handling and a superior grip. If you like this product you can find and purchase it on Amazon. The Bowie-Style Fighting knife (model # MT–20-12) manufactured by Mtech USA is a visually attractive blade and one that is highly functional. The weapon measures a full 10 inches and features a handle made of highly durable plastic materials. The price tag of the weapon is unbelievably reasonable at $15.71 to $15.99, depending on where you buy it. The weight of the knife makes it less than ideal as a throwing knife, but in other survival situations the knife is well suited. The blade has a superior angle and remains sharp for an extended period. Like this amazing product? Then you can check the current deal for it on Amazon. The SCHF3 Schrade Extreme model survival knife is an excellent weapon to list among the top fighting knives on the market. This weapon features a fixed blade and a very comfortable price tag of about $43.00. This full tang weapon has a Bowie Blade that is partially serrated and made of high carbon stainless steel. The blade is black and the handle is both grooved and textured to ensure an excellent grip when the knife is in use. The weapon is less expensive than the Gerber Strongarm is and it has a more versatile knife tip in comparison. You will find it ideal for carving, batoning logs, and chopping. Like this amazing product? Then you can check its price on Amazon. 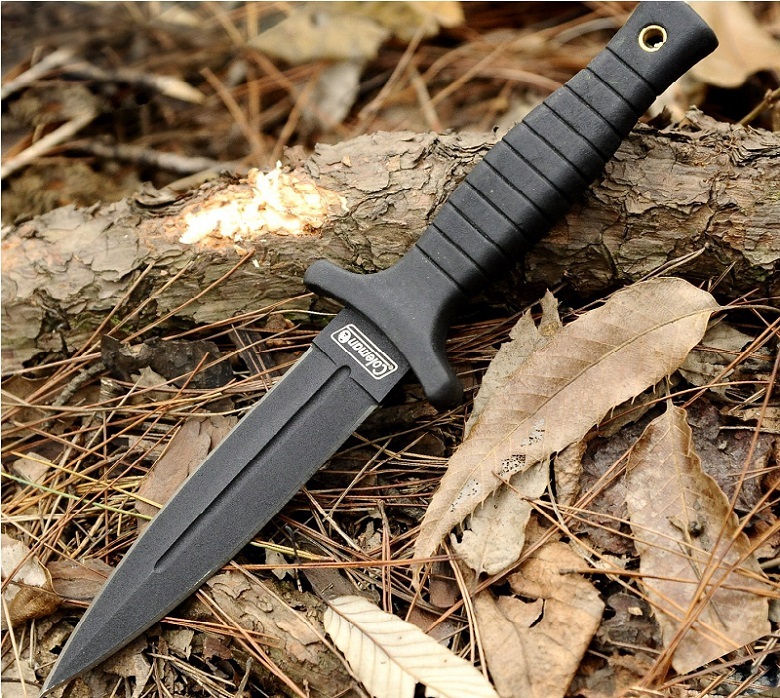 The MU-1119 model by Master USA is a tactical blade unrivaled in the industry. The entire blade is 6.75 inches in length, but it is a workhorse of a blade and the price is impossible to beat at $6.88. The color of the blade is black and the weapon features an attractive cord-wrapped steel handle. The weapon is not intended for use as a throwing knife, but it is great for basic work tasks and self-defense. 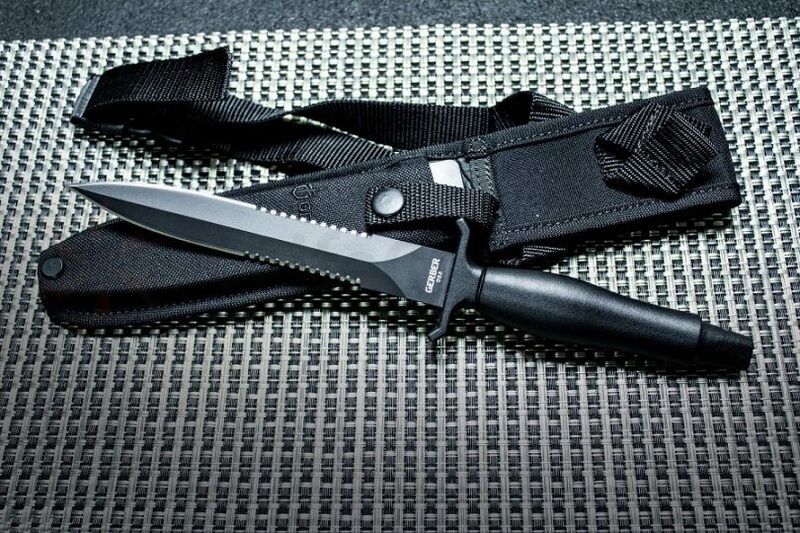 The knife comes complete with a lanyard and plastic sheath for storing the weapon when not in use. 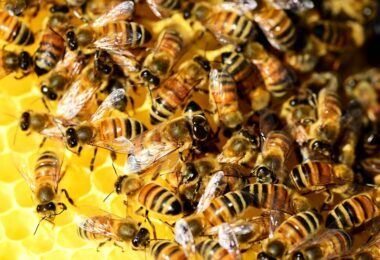 The blade alone measures 3.25 inches in length making small enough to stash and hide. If you think that this product could be useful for you, then you can check its price on Amazon. The Coleman model CM2010 is an exemplary weapon hosting a fixed 9 inch long knife. The weapon is priced between $9.89 and $32.99, depending on where you buy it. The knife has a 4.7-inch long blade made out of high-quality 3CR13 stainless steel. The blade is a popular choice due to its solid construction, durable design, and low profile style, and is excellent for a variety of work and defense tasks. The dimension of the weapon is 9x2x0.7 inches (length x width x height) and it weighs 5.9 ounces in all. Not intended for use as a throwing blade, the Coleman fighting knife features a handle made of durable, dense, heavy rubber materials. This weapon is also ideal for diving adventures and the blade is a double-edged. The blade is sharp and easy to sharpen. If you think that this product could be useful for you, then you can check its price here. To choose the best blade, you will need to take into consideration the size of the weapon you desire, how you want to carry the weapon, and what you want in terms of special features. The price is another factor that comes into play when looking to invest in a knife that will serve you well for years to come. You will want to buy a weapon from a trusted manufacturer that demonstrates a commitment to creating weapons of excellence. Tested products and those made with the utmost safety in mind are the kind of fighting knives you should consider. Do read on our basic knife safety tips for your protection. 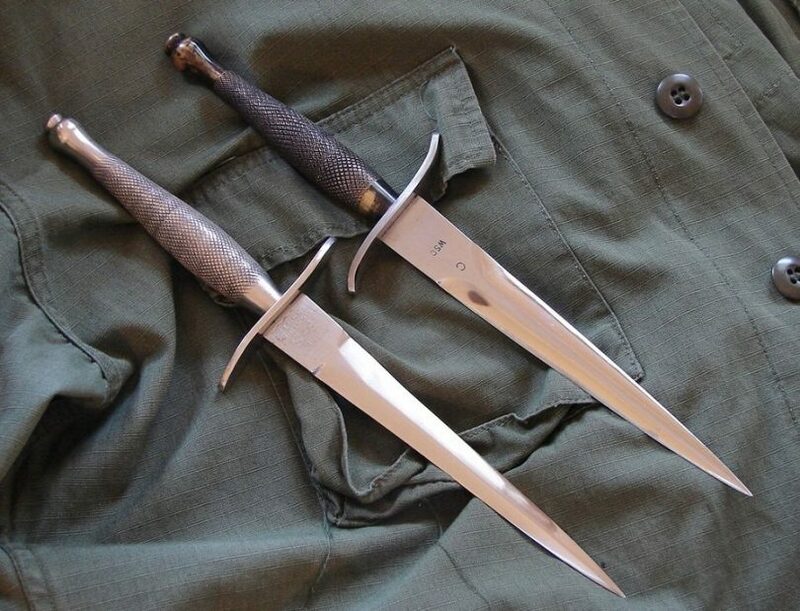 In the end, you may even want to buy more than one fighting knife for different types of survival situations and uses. A good, multiple use weapons can be your first choice. You can then make a future investment in a fighting blade that is for a specified purpose like self-defense or use in hunting, camping, or fishing pursuits. Ammo Storage: Bang-Ready Ammo for Decades! Andrew McKay is a seasoned hunter and fisherman from Anchorage, Alaska. Andrew thinks that he is the luckiest person in the world, as he lives in the most gorgeous place in United States and does what he loves to do. As a member of Alaska Professional Hunters Association and International Hunter Education Association, he is always looking for the ways to improve his skills and to teach people around him.